The season is summer, not sure the month. We've been holed up in TG HQ for seven years now. The zombies have fought long and hard, but the tide is seeming to finally turn. We will survive this invasion, this walking pestilence. 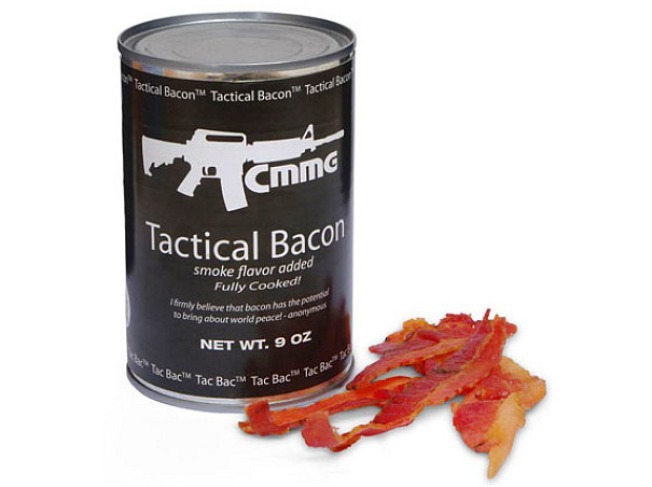 We will, because we were smart enough to stock up on Tac Bac - Tactical Canned Bacon. Yes, we have been surviving on bacon. That is why we are strong; that is why we'll win. OK, so it's not for everyone, but this silk Marc by Marc Panthera Dress (was $568, now $199) caught our eye because of its shiny-bold pattern and utterly unapologetic ruffles. This dress sure knows how to multitask -- strapless, ruffles, a dangling box, a see-through portion. So we can't quite decided why we're so captivated. We just know we are. Maybe you don't actually qualify for the Boston Marathon, but that doesn't mean you can't wear the shoes. Really. The adidas Men's ZX8000 Boston Marathon Edition are on sale now (were $100; now $79.97) at City Sports (1111 19th St. N.W., 715 7th St. N.W. and 7121 Arlington Road, Bethesda). However, if you order online, you can take an extra 10 percent off one item, 20 percent off two, or 30 percent off three with code SummerBlitz.